Resource Generation | What is social justice philanthropy? 1. Social justice philanthropy focuses on the root causes of economic, racial, and social injustice. This means that social justice philanthropy supports organizations that are getting to the roots of problems instead of only addressing the symptoms. An example: In a community with widespread asthma due to air pollution from a nearby bus depot, it’s the difference between just funding medical treatment for people with asthma and funding organizing in the community to regulate bus idling and emissions. 2. Social justice philanthropy strives to include the people who are impacted by those injustices as leaders and decision-makers. In social justice philanthropy, the process of giving is as important as where the money goes. Asking those who are directly affected by and working on an issue what to fund is a key part of this process. An example: This might mean that a foundation or donor interested in addressing the widespread asthma problem would include local residents and organizers in their decisions about where to direct their funding. 3. Social justice philanthropy also aims to make the field of philanthropy more accessible and diverse. Because right now this isn’t the case. For example, a study done by The Joint Affinity Groups shows that 10% of foundation board members and only 2.2% of family foundation board members are people of color. 4. In social justice philanthropy, foundations are accountable, transparent, and responsive in their grant-making. When funding happens behind closed doors, everyone who applies and relies on that money has no information about what goes on. Organizations get funded, but they don’t know why or how they were chosen. Or organizations don’t get funded and they don’t know why or whether they should apply again. When foundations and donors are transparent about their process and goals, it can open up the possibility for conversations about whether the grantmaking is responsive, and the ways in which foundations and donors can be accountable to the communities they impact. 5. Donors and foundations act as allies to social justice movements by contributing not only monetary resources but their time, knowledge, skills, and access. 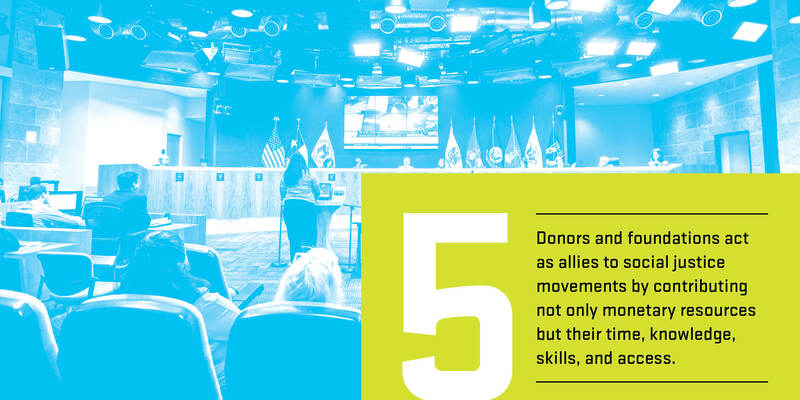 There are many concrete ways donors and foundations can be allies to social justice groups, from helping an organization fundraise to sharing your access and powerful connections to hosting an organization’s event at the foundation’s office. It is also about respecting grantee groups as partners in social justice. An example: One of the board members of the foundation plays golf with the city’s Public Transportation Commissioner. When she learns from their grantee group that they have been unable to get a meeting with the Commissioner, she uses her connection to help them set one up. 6. 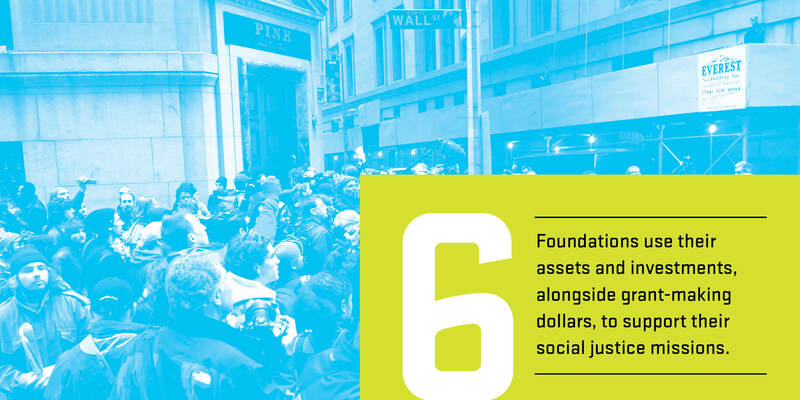 Foundations use their assets and investments, alongside grant-making dollars, to support their social justice missions. Foundations are mandated by law to pay out at least 5% of their assets. This 5% can include not only charitable giving but administrative expenses as well. This often leaves the vast majority of a foundation’s assets in its investments (as much as 95%). Social justice philanthropy employs investment dollars in alignment with the foundation’s larger social justice mission. This is often called mission-related investing, impact investing, or program-related investing. How much money goes to progressive social justice anyway? In 2006, $2.3 billion of foundation funding went to progressive social justice out of a total of $19.1 billion in giving, or less than 12%. This amount includes family foundation, private independent foundation and public foundation giving (The Foundation Center: “Social Justice Grantmaking II,” 2009). A recent report showed foundations gave $1.76 billion for social justice causes in 2002. In the period between 1998 and 2002, social justice giving grew by 53.4 percent. However, this impressive number is overshadowed by the fact that total giving rose by 64 percent during the same period, causing the percentage of foundation giving that was earmarked for social justice grants to drop to 11.8 percent. (NCRP– Creating A Philanthropic Sector That is More Responsive to the Needs of Diverse Communities; p. 6). Resources for Young People in Philanthropy, 2010. A list of organizations, programs, and publication for young people involved in philanthropy. 52 Ways to Take Action. Topics include personal/family, governance, investments, grantmaking, education, and advocacy. Glossary of Terms. You are not imagining it—the field of philanthropy is full of lingo and acronyms and tax-related terms. We have compiled this glossary from definitions provided by the Donors Forum of Chicago, The Foundation Center and included a few of our own. RG’s Social Change Giving Workbook. The place for an even broader list of resources, tools and roadmaps for creating a plan that works for you! Classified: How To Stop Hiding Your Privilege and Use It For Social Change by Karen Pittelman & Resource Generation. Inspired Philanthropy: Your Step-By-Step Guide To Creating a Giving Plan, Second Edition by Tracy Gary & Melissa Kohner (San Francisco: Josey Bass, 2002). Robin Hood Was Right, A Guide to Giving Your Money for Social Change by Chuck Collins, Pam Rogers & Joan P. Garner (New York: W.W. Norton & Company, 2001). The Bolder Giving Workbook: Discovering Your Full Potential. Free download at www.boldergiving.org. The Inheritance Project. Reading for inheritors from inheritors.